The tarantula molting process (ecdysis) can be a surprising and confusing event to the uninformed. It’s best to think of the process as something similar to what lizards and snakes go through, except much more critical and life-threatening. It’s a very precarious time that requires a bit of planning. Molting is necessary for pet tarantulas—in simple terms, it’s how they grow. What we’ll explain is the process by which a tarantula sheds its exoskeleton (external skeleton). The exoskeleton is essentially a shell—it protects internal organs and provides support, as tarantulas don’t have bones. 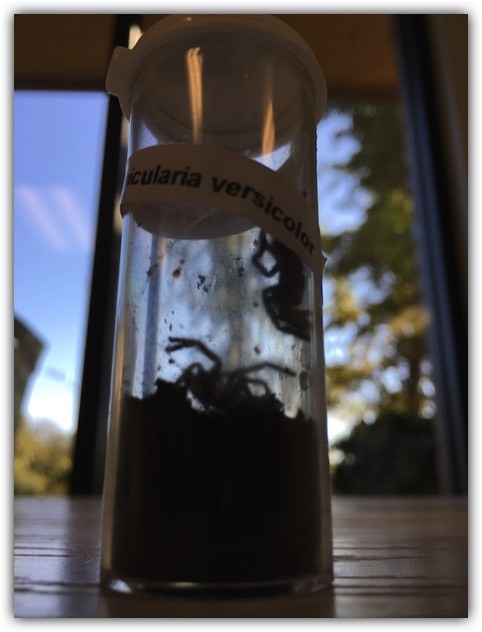 Does it look like there are two tarantulas in this vial? it leaves a virtually perfect replica of itself behind. 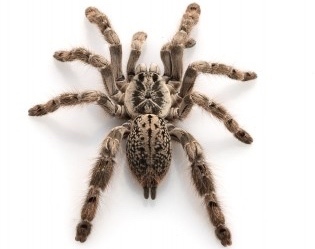 There are a few signs that your pet tarantula is approaching a molt. First, they usually stop eating several days to a couple weeks ahead of time. You may also notice a bald spot develop on the surface of the abdomen. What happens is, a new soft exoskeleton develops right inside the old exoskeleton. It’s a bit shrunken so that it fits. 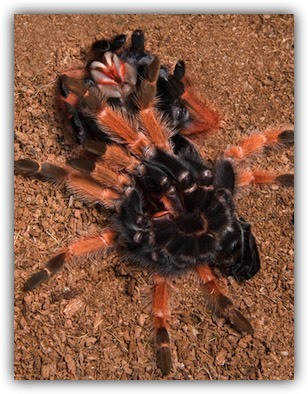 Once the time arrives, your tarantula will flip over onto its back. Don’t worry, it’s not dead! Tarantulas almost always molt on their backs. The entire process can take as little as a half-hour, to as much as 24+ hours. First, the carapace will break. (the carapace is the top of the tarantula.) The spider will then slowly but surely pulsate its way out. It generally happens so slowly that you don’t even notice it. spider is emerging on the right (white fangs). Once the tarantula emerges from its old exoskeleton, it will look new, fresh, and exquisite! It will also leave behind it a perfect replica of itself! I’ve included a picture above showing this phenomenon. Don’t handle it at this time—it can be fatal for the spider. The exoskeleton is still hardening, and it will take days for it to finish. 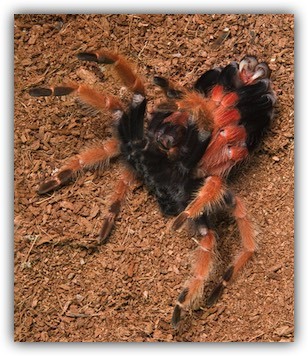 During this time, your pet tarantula is very sensitive and vulnerable. Do not offer it food until the exoskeleton finishes hardening (usually around a week), as crickets can prey upon the defenseless tarantula. Molting trivia - Did you know? The frequency a tarantula molts is based upon its size. So, spiderlings molt several times per year, whereas a sub-adult might molt 1-2 times per year, and an adult may not molt more than once every couple years. The incredible thing about a molt is that if your tarantula is missing a leg, a new one will appear after the next molt! Now, it may not look as full as the original, but it’s mind-boggling nonetheless!